Here is another online piano lesson on how to play the octaves ; learn new techniques and tips for playing piano better. I now come to Octave Technique for which every sort of studies have been and continue to be written. Now the real octave wrist, combining great strength with high nervous tension and suppleness, is a gift of nature, like the capacity for playing staccato bowing on the violin. are so many studies devised on this most difficult branch of piano technique that it is best to work with them. Those of Kullak are, I find, especially excellent. 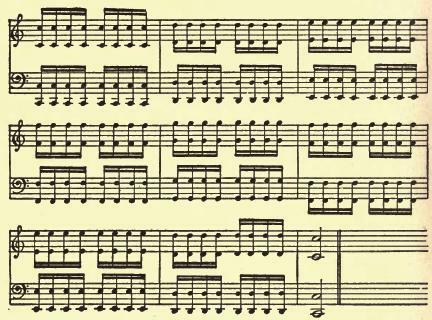 It is very unwise ever to work at octave playing for more than ten minutes at a time, as it is so fatiguing and may injure the arm if overdone. But there are ways of helping oneself to relieve exhaustion during long sequences of octaves. Some of these devices are useful for all, though generally each player finds out means for himself according to the structure of his own particular muscles.